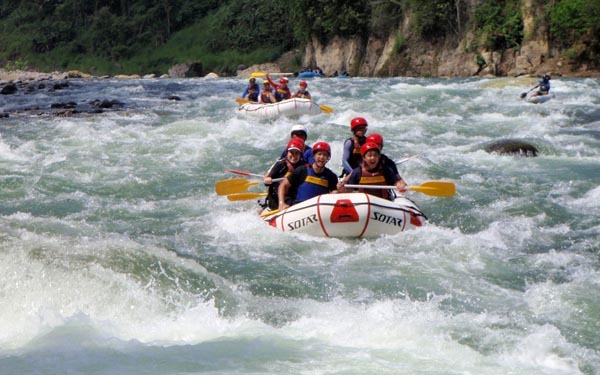 River Rafting along Cagayan de Oro River with Great White Rafting Co. 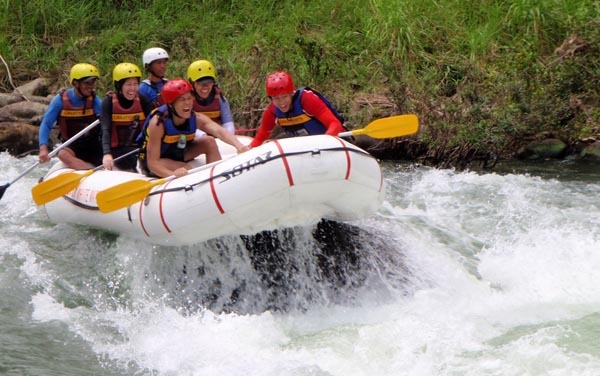 I was already over a month in Cagayan de Oro without ever trying their much talked-about tourism-offering - white water rafting. 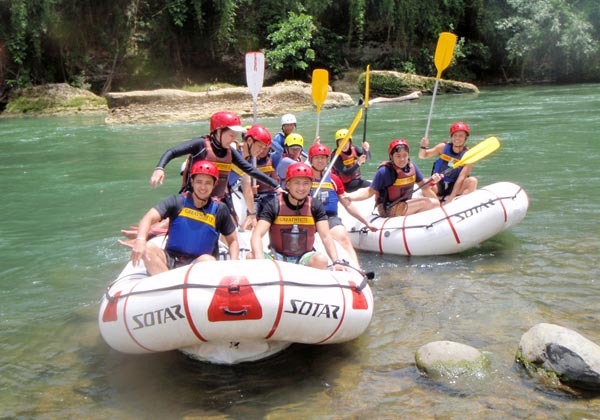 In fact, in the same way that Siargao has its iconic branding on surfing and Coron with its wreck diving, Cagayan de Oro lays claim on water white rafting. 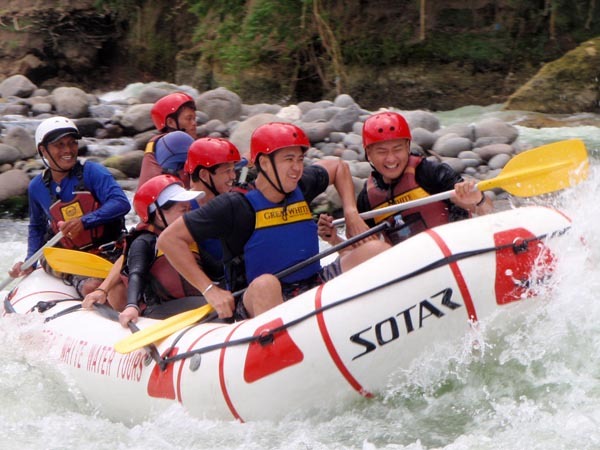 White water rafting is offered in other parts of the country - Chico River in the Cordillera Mountain of the north, Tibiao in Panay, and I later learned, also in Davao. 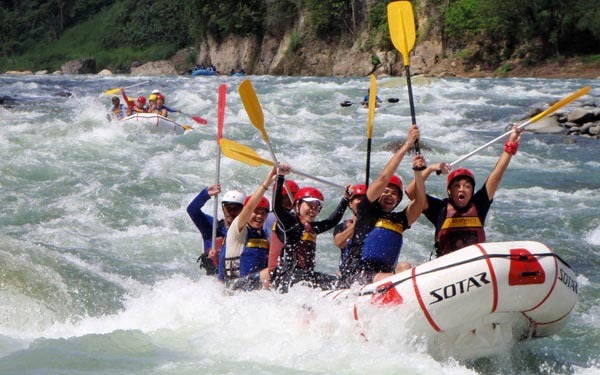 But in the Philippines, when "white water rafting" is mentioned, Cagayan de Oro quickly comes to mind. 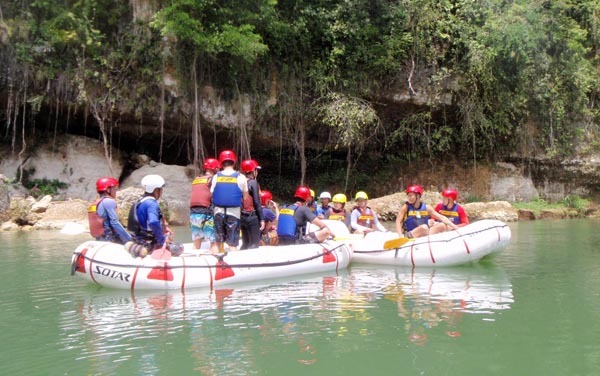 CDO has 5 established players offering the tour package, and the industry itself is already well developed. 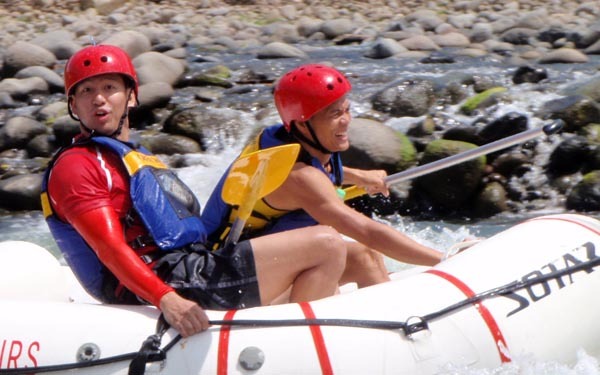 When I was invited by Great White Rafting to do their ride, I was gung-ho to finally find out what CDO river rafting is all about. I was picked-up straight from my hotel (and brought back the same way). Usually though, the pick-up point is Coffee Works beside Xavier University. 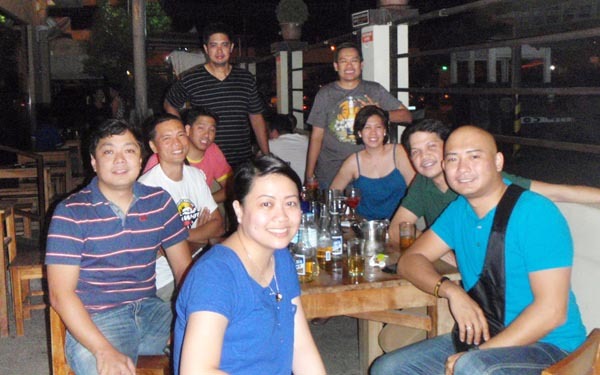 I was a joiner to a Manila-based group of 8. We bonded well during the day's ride and was even invited to join them for drinks later that night. I dare not mention where they work since I suspect some of them called-in sick that day. LOL! 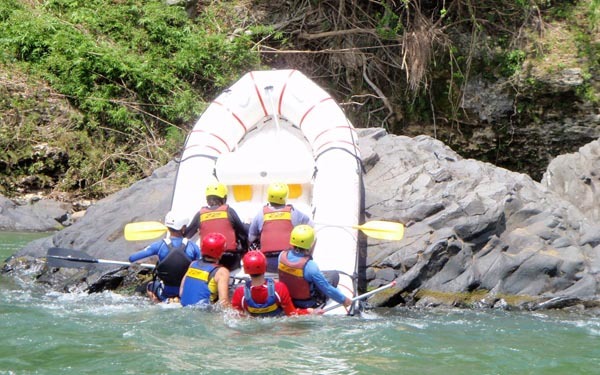 After going 12 kilometers up river, the raft was set up on the river bank bordering the Cagayan de Oro - Bukidnon boundary for the basic grade rafting (14 rapids). 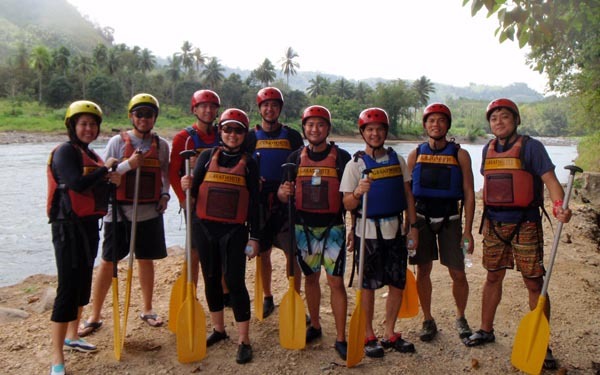 We were given the standard gear - helmet, vest and paddle. 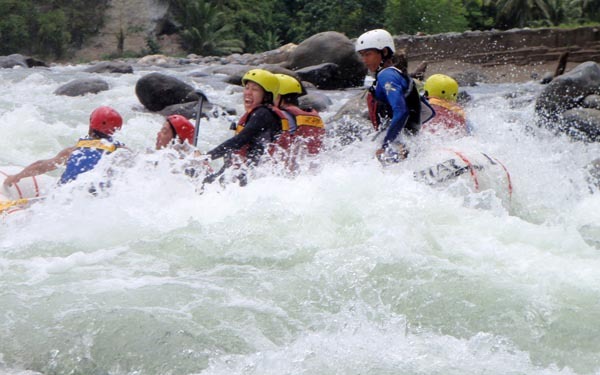 There was a brief orientation by our guide who gave us a high-level picture of the rapids that lay ahead, the do's and don'ts and the paddle 'high 5'. 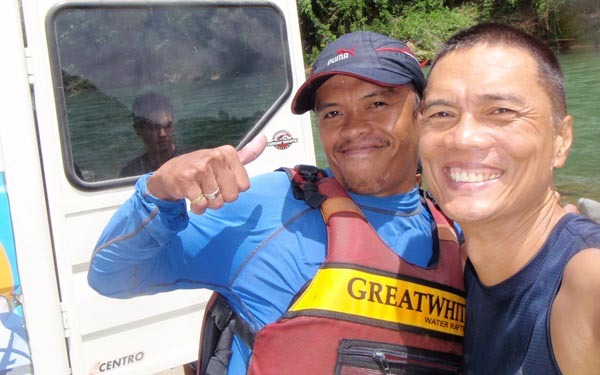 Our cameras were collected for a full-time camera crew on a kayak to just take our pictures! How cool is that? Just is just soooo forward-thinking. That practice should be emulated across the country! 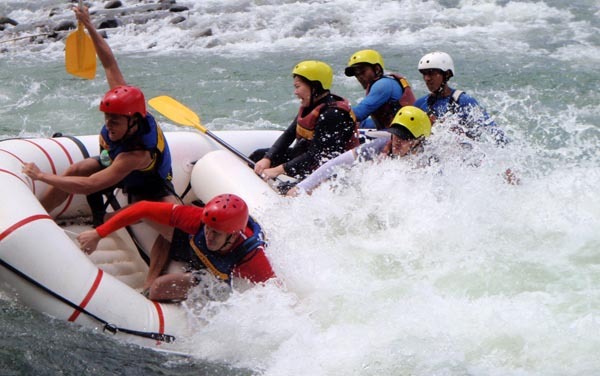 Our group was divided into 2 rafts to avoid over-crowding. Our guide did a good job telling us stories during the 3 hour ride. The camera crew meantime would head out forward and wait at pre-determined spots for a perfect shot. Mid-way, they served us Vjandep Pastel and bottled water. 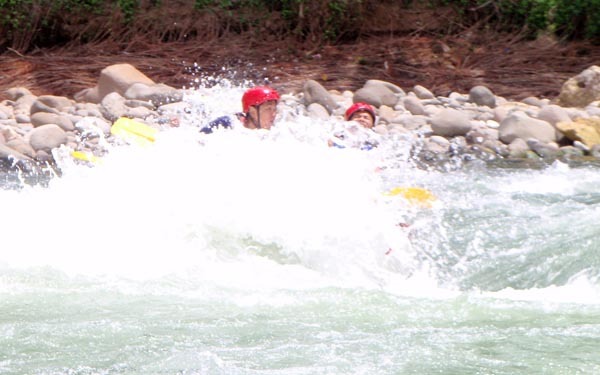 I lost count, but we were supposed to go through 14 rapids. 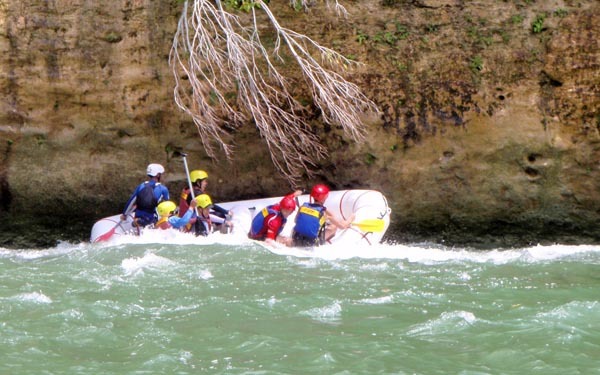 Some of them were adrenaline-sections that nearly threw us off the boat, some were caffeine moments and some were more like stutters. 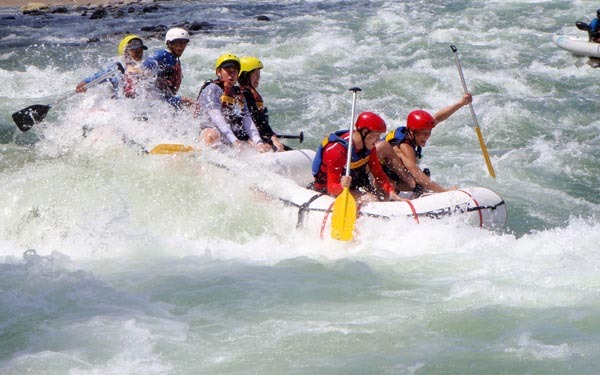 I hear that to get the most excitement, you really have to go the whole 9 yards and take the 21 Rapids course. 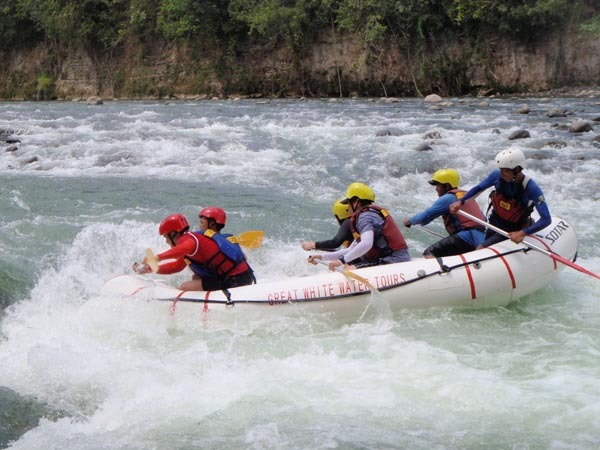 During the entire ride, we shared the river with other travelers from a different rafting company. 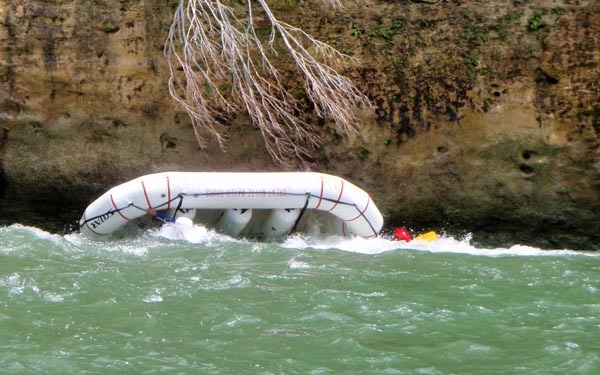 The rafts are color-coded. 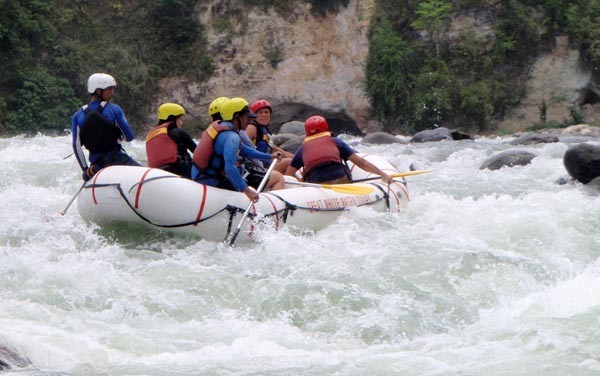 If you see white rafts, that's Great Water Rafting. 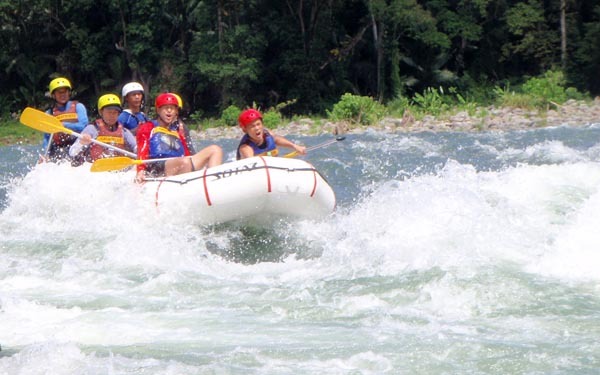 Dec 2011 saw the most devastating flood that wreaked havoc in Cagayan de Oro. The river flooded (largely due to illegal logging, illegal mining that uses water-blasting for accelerated land erosion, etc.) 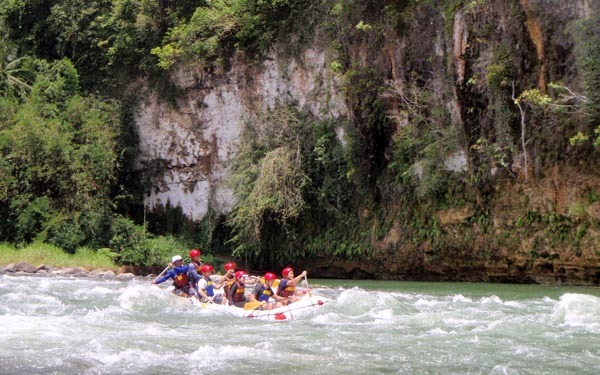 and rearranged the mightly Cagayan de Oro River-scape. Water level rose perhaps 20 feet (judging from the water mark that still scar the river berm) bulldozing everything that lay in its path. 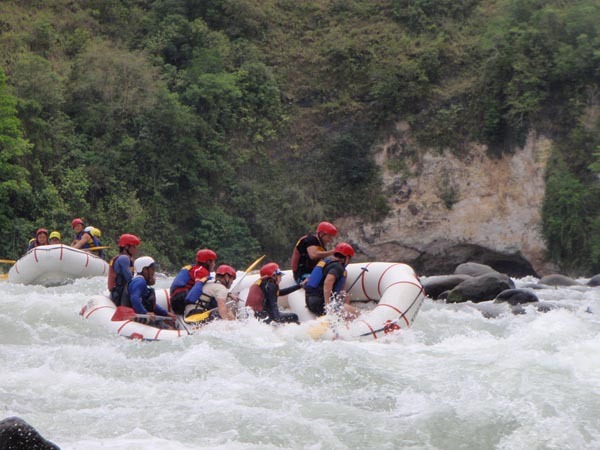 From what the guide told us, the technical rapids sections were relocated in several places. I'm glad to have met this fun-loving (and hard drinking!) office crew from Manila. They had been doing this annual jaunt together for years, usually holding it in different destinations. After this, they're thinking of where to go next. 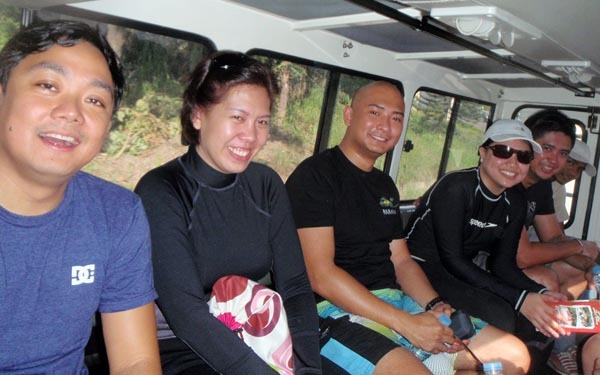 I suggested Coron given the wreck-diving, snorkeling spots, island hopping boat tours, mountain biking and just for the chillout factor. I joined them for drinks later that night at Yuri's and chow at Maxi's. 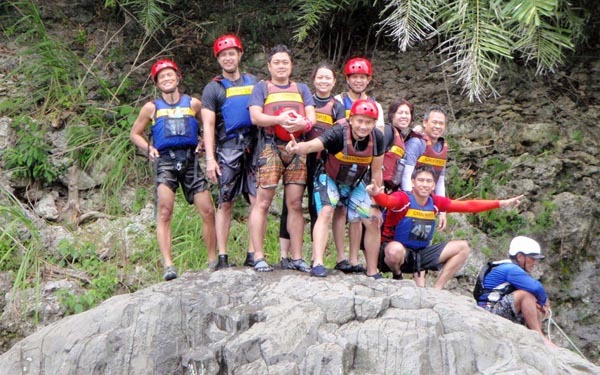 They'd be doing Dahilayan Adventure Park the following day. I hope to hook-up with them when I visit Manila. 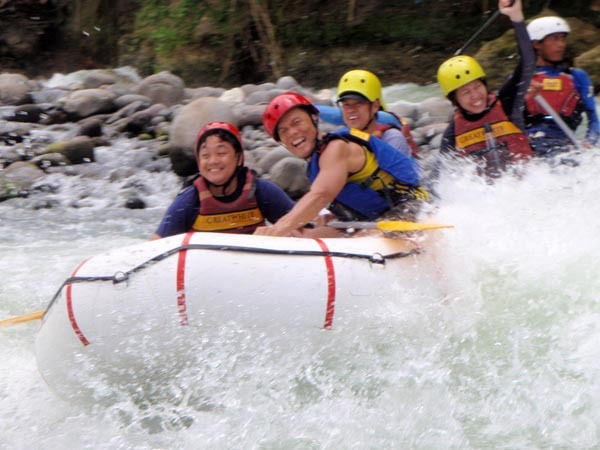 It would seem that Great Water Rafting's operation is a well-oiled machinery. They have already done some thinking-through and the efficiency is evident - personal belonging lock-up, full-time camera crew, pastel snack with bottled water, prepared lunch, door-to-door pick up (or at Coffee Works), the story-telling guide, etc. 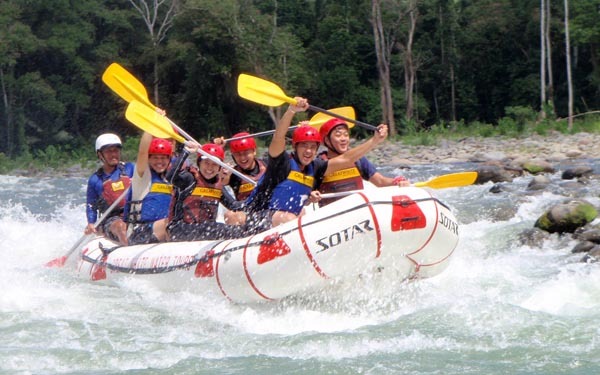 I could imagine that they'd be quick to improvise and add even marginal efficiencies for increased fun and comfort. Many many thanks to Bimbo and the cool staff and crew for making this happen for me. 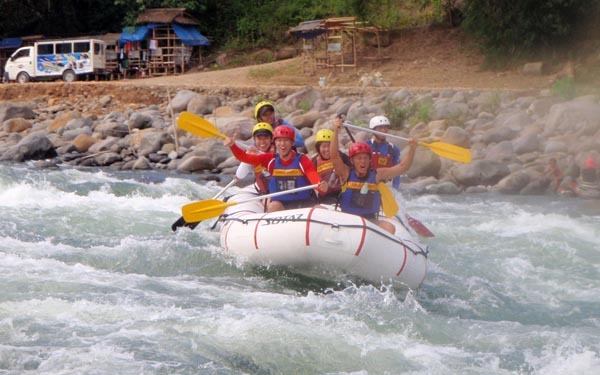 Great White Rafting comes in many names: Great White Rafting (logo), Great White Water Rafting (painted on the boat), Great White Water Tours (posters) and River Rafting CDO (domain name). Confused? Me too! ps - If you want me to objectively cover your resort for this website (beach resort, mountain resort, island resort, etc. ), email me. 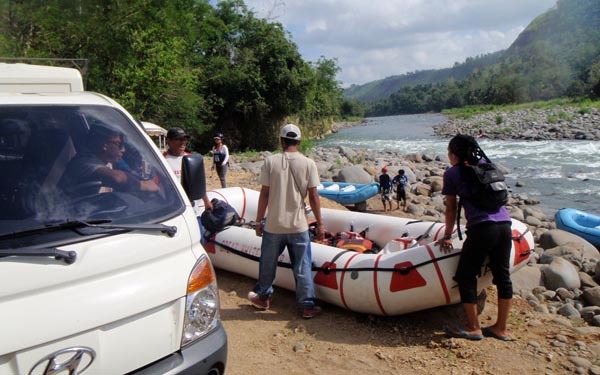 The entire tour is a door-to-door pick-up. 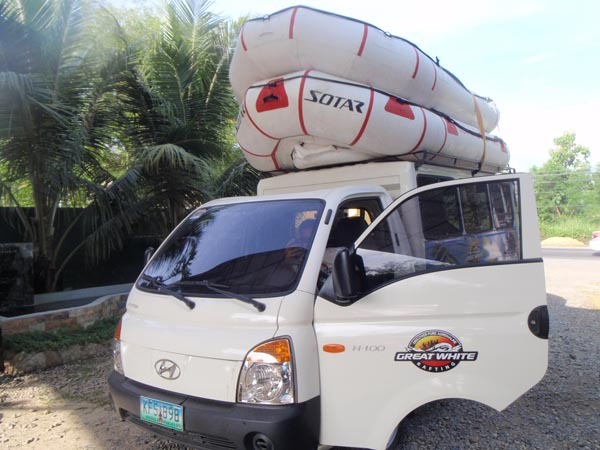 Usually though, with pre-arranged bookings, pick-up is done at Coffee Works beside Xavier University in Divisoria. Just tell any jeep driver or tricycle driver to drop you off Xavier University. They'll know that. 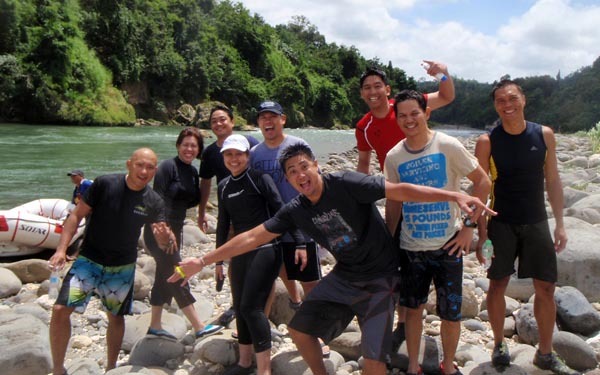 (Mar 10, 2013) just sharing....summer kick-off with the boys and Jovy :) Blog courtesy of Gigit..
(Mar 7, 2013) Looks fun, Gigit!! 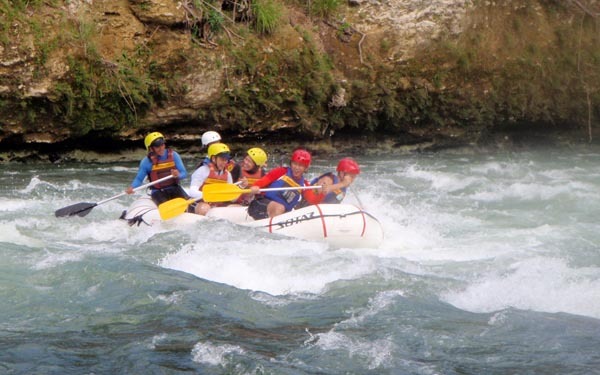 (Mar 7, 2013) I really wanna try this. Actually meron din dito Git, sila Jackie din nagseserve. 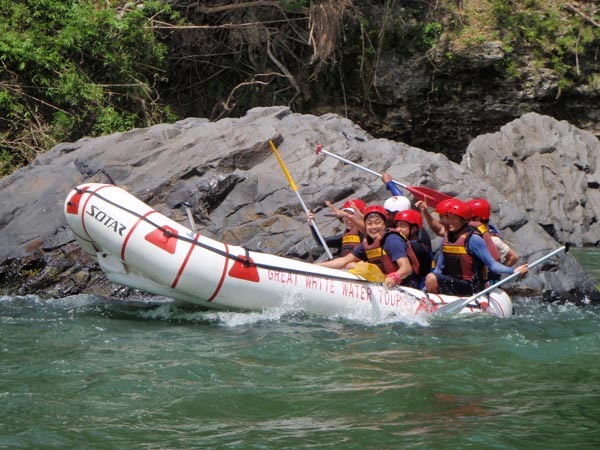 (Mar 7, 2013) I took that too, 2 years ago...and we had the funniest guide ever w/c made the adventure quite remarkable! 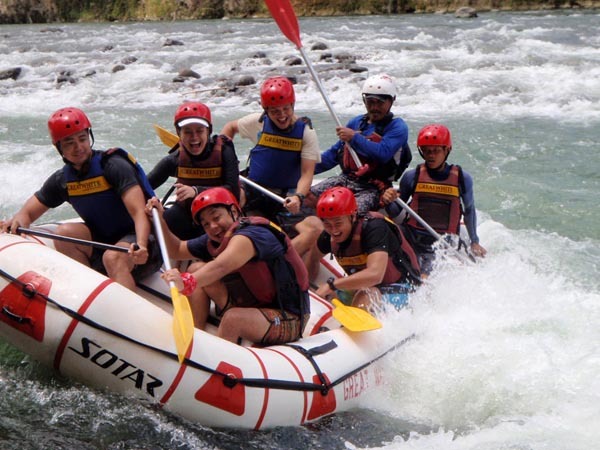 Great Water Rafting din..the name of our guide is Tata. Did you do the advance? It's more thrilling, Git. Sa Davao, super mahal, 2k per pax kaya di na kami tumuloy when we were there. I was negotiating if they can remove the t-shirt, lunch and free ticket at the Crocodile Park para maka discount kami kahit P1.5K...but still they did not allow - *very tourist friendly*. 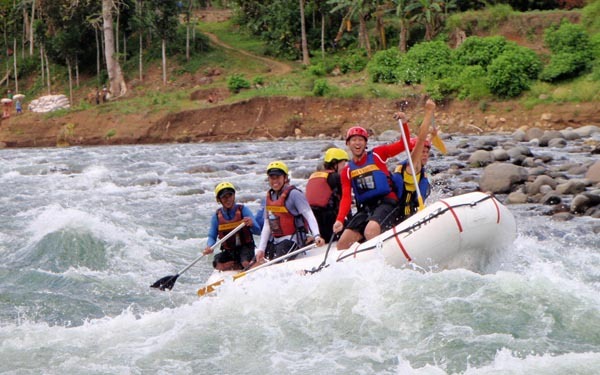 From what I read, they have more rapids in CDO than in Davao.